﻿ How to Develop a Successful Event Marketing Plan » Red Mango Marketing! Just like a dinner party, a business event is only as successful as the number of attendees who attend, see, and spread the word about the value they received. That’s where event marketing comes in. Organizing an event, personal or business, requires immense planning, attention to detail, and consistent ideating. When you host an event, online or offline, make sure to have a specific goal. This goal could range from promoting your business, product sales, networking, work-shopping ideas, or simple, valuable fun and excitement. The main idea behind event marketing is to raise awareness about your business. But remember, it all starts with a plan. You should start creating an event marketing plan as soon as the event idea is born. This idea is then followed by brainstorming, organizing, attending to every detail, and finally, execution. It may sound like a lot, but with the right plan–you got this. You should start creating a plan, using a guide to event marketing, as soon as the event idea is born. First things first, managing an event and marketing it are two completely different tasks. While event management comes much later, event marketing begins at the word go. Constant Contact allows you to create, send and measure powerful email marketing campaigns that drive success. Why are you hosting the event? What is your motive and objective? What is the goal of the event? These are the first questions that need to be answered, as everything that follows is based on their answers. An event can have a single or multiple goals, but what matters is that you name one and that you align all marketing tactics to achieve it. For example, if your goal is sales, the content you build to market the event needs to drive towards sales. Similarly, the way you attract people should focus on sales. It’s normal to want it all, and want the best of everything, but that often leads to a hole in your pocket. Set a budget for your event, and stick to it. It’s easy to overspend, but it’s extremely difficult to make up for the extra money spent. You work hard for every penny, so make a budget and spend it wisely. There are two things you need to think of when marketing the event: the medium (or platforms), and the content. There are many ways to market an event. 40% of businesses use social media to market an event, however, email marketing, at 76%, is the most popular. When you are planning your content marketing strategies, keep the goal of the event as your foundation. You could start by building an impactful website for the event, or add a pop-up or landing page to your existing site. Curate text, and video content, like an event trailer, behind-the-scenes footage, or a sneak-peek. All content must entice the viewer to attend the event. The content marketing plan needs to create a buzz around the event, making people excited to register or RSVP. Your event marketing registration efforts should get the word out and boost your attendance. You can’t do it alone. If you don’t have someone that can share the content you’ve created according to your content management plan, then you can use email automation. This lets you share and manage content by yourself, but with the efficiency of having a delegated resource. Make sure the content goes out on time to see better results. Now that you have your content in place and the mediums to promote the event, it’s time to hit send. Here you need to raise awareness, reaching out to as many potential customers as possible, and ensure that your existing customers are invited as well. When future attendees are excited and see the value in your event, you create a buzz that draws more attention. Promote social sharing, social comments, audience interactions, and other discussions. Whether you have collaborated with sponsors, or partnered with other businesses to host the event, it’s important that you work on the same goal. When multiple businesses and sponsors work together, they can create more value and excitement for the event attendees. Sketch out your event marketing plans, in sync with all those involved, to create a more impactful and error-free plan. Sending emails to promote your event? Measure and evaluate how they’re performing against pre-set goals and objectives. Using social media to attract registrants? Measure and evaluate the data. Promoting the event offline? Measure and evaluate the results. The point is, it is necessary to evaluate the results of your event marketing strategy to know what’s working and what isn’t. This can help you make stronger plans and tweak the strategy along the way to make the most of your efforts. A powerful marketing strategy conveys the answers to those questions. You know the event you’re hosting is going to be fantastic, but your audience needs to see that too. Coming full circle, this is only possible when you have a set goal for your event. It’s the goal that helps you present the value to the event attendees, and it’s the foundation of your whole event marketing plan. This event marketing email works because it uses a strong Halloween design theme to instantly catch my attention. It tells me everything I need to know, but holds back some details to pique my curiosity, for example, the special menu. The email also tells me the approximate costs, which is often a big decision maker. There’s also more to the event than just food and drinks. Showing that there are fun games and face painting lets me know this is a great event for the entire family. Sending this a few days before Halloween is just enough time for me to make a decision. Since sending emails to subscribers is just one medium to market an event, the restaurant included hashtags, as well as social media buttons, for readers to share and engage with them online. They also aggressively promoted this event on their social media pages. The goal of the email used here is clear: the restaurant wants to increase sales using a Halloween themed event. The goal could have been to get more people to sign up for updates on future events or to raise awareness about the restaurant, but the event email stays focused on promoting the event, which will, in turn, increase the awareness for the restaurant on its own. Leave the stress out of event promotion with the right plan. Believe me, it’s not a tough nut to crack once you have spent enough time thinking through your event marketing plan. The best part is, it only gets easier as you host more and more events. Remember the first time you hosted a movie night at your home? It took some effort to source the perfect movie, arrange the seating, and provide great food, but now everyone still talks about the great time they had. You already have the skills to be a great host–you’ve done it before. It’s time to start planning. 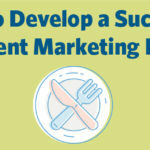 The post How to Develop a Successful Event Marketing Plan appeared first on Constant Contact Blogs. This entry was posted on Wednesday, December 19th, 2018 at 8:00 am	and is filed under Email Marketing, Event Marketing, News & Updates. You can follow any responses to this entry through the RSS 2.0 feed. Both comments and pings are currently closed.